Have you ever given a thought as to how much money you require for your retirement? How much savings will ensure you that you have enough money to outlast you? If not, this is what we are going to discuss here. Let’s analyse, how much money you actually need for your retirement? We’ll probably answer your query as to: How much I need to retire comfortably? 1. We live in a country where the state provided social security is not enough to support us in our retirement. 2. Unlike our parents, most of us are doing jobs which will not have any structured retirement pension/benefits. 3. Our generation has to bear a high cost of living. If we don’t plan well now, we are going to spend a lot of time without any active income. 4. Inflation can impact all of us in strange and crippling ways. We have to find fruitful ways to face this inflation situation. Good retirement planning is surely the best method to overcome this. What is the lifestyle that you wish to maintain during your retirement? Estimate of how many years you want to plan to spend in retirement. Understand how inflation will span out in all these years. 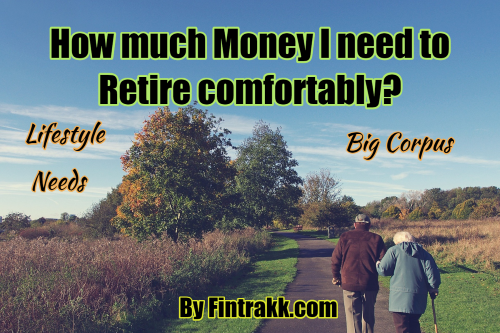 Let’s highlight few important points before concluding how much do you need to retire comfortably. The primary step to understand your retirement needs, is to understand your current expenses and budget. If you do not have a proper budget create one today. Budget creation can be as simple as jotting down your key expenses in a spreadsheet and may be tagging it with basic expense heads like health/food/travel/entertainment/rent etc. You know your major expenses, so add different expense heads to it. You can include an additional column to your spreadsheet to specify if you would need this expense post retirement. Also, put up whether that expense will increase or decrease during your retirement. Think of any new expenses that might hit you during retirement typical example can be increased health expense, care taking expense, travel expense. If you want to travel a lot post retirement, (a cherished dream for many) keep this is mind. You have an idea of your retirement expenses in today’s money. Let’s project how much money you need to maintain the healthy lifestyle you want for yourself. To do this, you will need to make an additional assumption on how inflation will look in the next few years. Below is a chart which maps historic inflation in India. If you see historically, inflation has been between 7-10 % in India. Take a reasonable estimate of inflation for your calculations. We have done some calculations using 7 % inflation see the chart below. ALSO READ Financial Planning & Debt Management: What you Need to Know? So, let us say your monthly current expenses are Rs.50,000. You plan to retire in 30 years and would want to maintain your current lifestyle and expense profile. The rate of inflation is 7 % . Now that, you know how much retirement expense you are going to have. Calculate the retirement corpus you need which can be put in a risk-free long term investments and will be sufficient to take care of your retirement needs. You can easily use a simple retirement calculator available to calculate the corpus amount. So, in the example above in order to maintain expenses of Rs.4.56 lakhs you would need a corpus of about 8.29 crores. That sounds pretty big! Isn’t it? An alarming call to start your investment planning. But, don’t worry this is just an example. The actual figures shall vary as per your own lifestyle, habits, requirements and real inflation rate. Finally, you have calculated the corpus that you shall need for your retirement. So, you have to plan your investment/saving journey to reach that corpus. For this, you would need to assume a rate of return you can get on your investments. Based on that rate of return, you would be able to calculate the monthly savings. In general higher the rate of return, lower is the monthly savings you will require. These are the basic steps you must follow to figure out How much you need to retire in a comfortable way? Financial planning especially retirement planning is a significant part of our life and we can’t ignore it. We all love to lead a peaceful and financially free after-retirement life. It’s high time you should think about saving and investing for your retirement. What do you think of it? How are you planning for your retirement? Do share with us. Nice post! One should start saving for retirement early. We can spend on pizzas and parties at young age. So, putting aside a small amount every month for old age shouldn’t be a big deal. We can at least start building a sufficient fund to help us support after retirement.